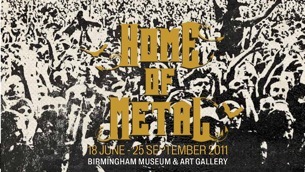 Tickets on sale for our huge Home of Metal exhibtion! Four decades since heavy metal was unleashed onto the world, Home of Metal arrives this summer, presenting a series of ambitious exhibitions and associated cultural programme which explore the foundations, social context and heritage of heavy metal culture, which has gone on to be a global phenomenon. Tickets for our huge Birmingham Museum and Art Gallery exhibition are now on sale! Book them here.